The CYBERSTORM PPC can only be used in the Amiga 3000 Desktop after a modification of the A3000 mainboard, as the CPU slot of the A3000 is missing an important signal (INT2) which is necessary for the operation of the PowerPC and the SCSI controller. 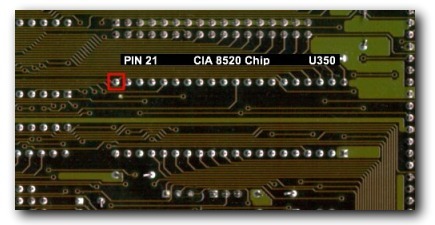 For this modification, one wire must be soldered to connect two pins on the bottom of the A3000 mainboard. This modification shall only be carried out by authorized service centers or experienced technicians. First thing to do is pull the Motherboard of the machine. Turn the mainboard to have the back side in front. If you look at the back of the Motherboard (the bottom side) at the pins that make up the CN606 you will see 1 of the solder pads that is square. This is Pin 1. With Pin 1 at the top Pin 2 is right and a bit up from pin 1. Pin 3 is right and a bit down from Pin 2. Pin 4 is right and up from Pin 3... then pin 5 starts a new row. 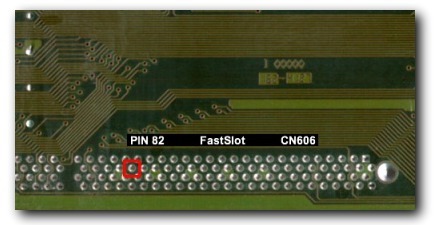 The picture shows only the right part of the two 100 pin "slots". Turn the mainboard to the top side and search for the CIA at U-350. On Pin 21 is the Interrupt _INT2 line available. 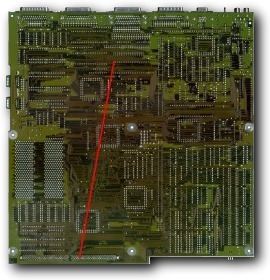 Mark the Pin and turn the mainboard to the back side. What you need to do is run a wire from U350 Pin 21 to CN606 Pin 82. Fix the wire with hot clue or some kind of tape. Thats it. If you did everything right your A3000 should now work witthout problems with the SCSI Module.